Evergreen; growing in coastal California; leaves leathery, toothed, shiny above; acorns conical, enclosed at base or up to 1/3 in scaly cup. 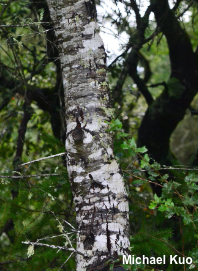 Note: Both coast live oak and tanoak are victims of Sudden Oak Death; tens of thousands of California trees have died as a result of the pathogen Phytophthora ramorum, a fungus-like organism. 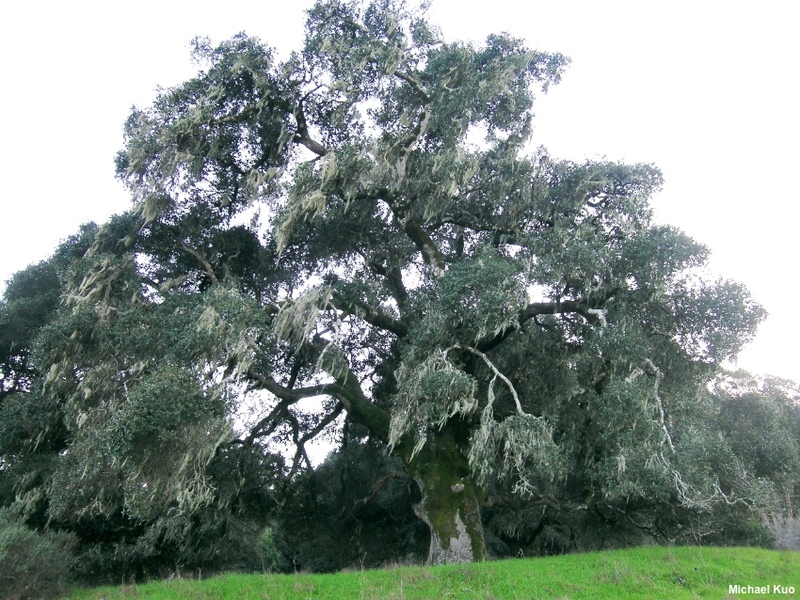 See the California Oak Mortality Task Force for more information. 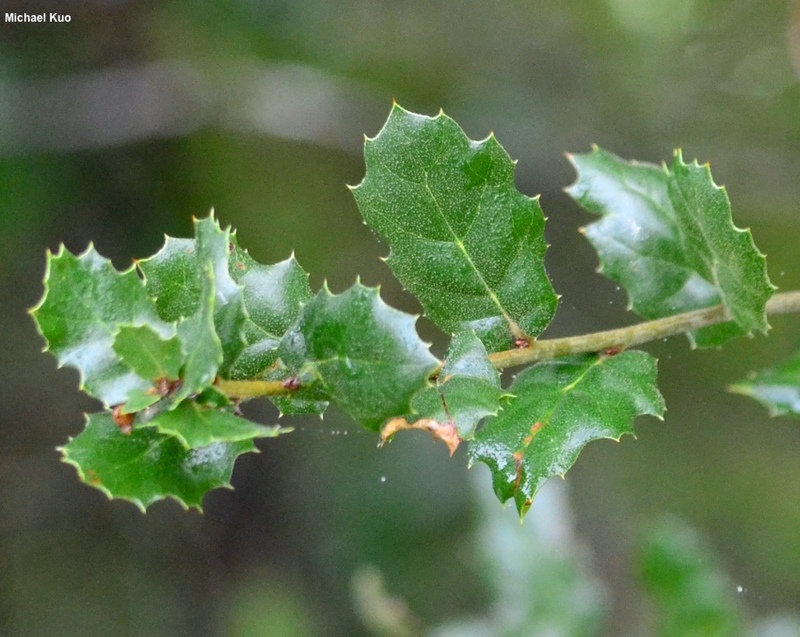 The live oaks of the West Coast can be difficult to identify to species. 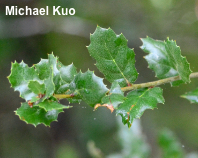 They are separated on the basis of acorn characteristics and leaf shapes and sizes, and include California scrub oak (Quercus dumosa), Engelmann oak (Quercus engelmannii), interior live oak (Quercus wislizeni), and canyon live oak (Quercus chrysolepsis). Some of these species hybridize with gusto, complicating the identification process. Habitat: Usually on dry soil; coastal California. Stature: 50-75 feet high; to 3 feet in diameter; trunk often divided into several main limbs that spread outward, creating a very broad crown (up to 150 feet across). Leaves: Evergreen; leathery; 1-3 inches long; unlobed; veined; toothed or spiny where the veins reach the edge; often with the edges curved under; dark green and shiny above; paler green below. Bark: Thick; grayish when young; nearly black and deeply furrowed or scaly in age; often covered with moss. Acorns: Bitter; to 1.5 inches long; conical; enclosed at the base or up to 1/3 in a scaly cup; interior of cup woolly. Agaricus hondensis; Amanita novinupta;; Amanita ocreata; Amanita pantherina; Amanita phalloides; Amanita velosa; Armillaria species; Boletus barrowsii; Cantharellus californicus; Chlorociboria aeruginascens; Clitocybe nuda; Craterellus cornucopioides; Gymnopus dryophilus; Gyroporus castaneus; Hebeloma crustuliniforme; Hericium species; Hygrophorus & Hygrocybe species; Inocybe species; Lactarius argillaceifolius var. megacarpus; Lactarius rubidus; Lenzites betulina; Lepiota magnispora; Mycena species, including Mycena californiensis; Phyllotopsis nidulans; Pleurotus ostreatus; Pluteus species; Tricholoma pardinum; Tricholoma saponaceum; and many others.